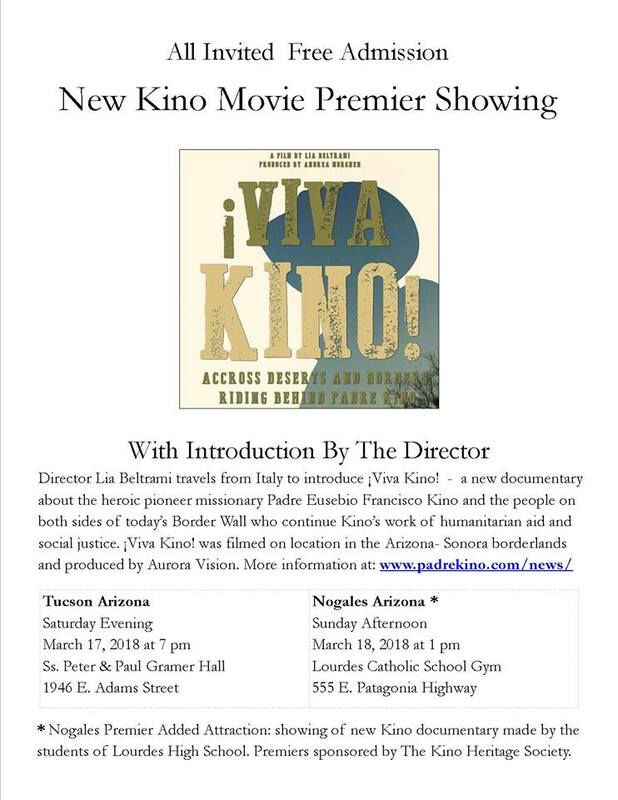 “Film Premier “Viva Kino!” – Tucson, Arizona Showing. Free & All Invited. Saturday Evening March 17, 2018 at 7 pm. Gramer Hall, 1946 East Adams St. – building east of Saints Peter & Paul School. “”Viva Kino!” presents how Padre Eusebio Kino’s work 300 years ago for human dignity and peace continues to live on through the friendships and humanitarian efforts of the people living on both sides of the Border Wall. In Italian with English and Spanish subtitles. The award winning Italian film company Aurora Vision traveled last May to today’s Borderlands of Sonora and Arizona to film on location. Director Lia Giovanazzi Beltrami and producer Andrea Morghen travel from Italy to introduce the film. The film’s full title is “Viva Kino! Attraverso Deserti senza frontiere tra Messico e Stati Uniti” with Italian narration with English and Spanish subtitles. Aurora Vision’s documentaries and other films tell stories of people of goodwill around the world who are creating peace, social justice and hope. Many films show people of different religious traditions and their promotion of understanding and human solidarity. Other Aurora productions include documenting the lives of a Olympic gold medalists, a 16th century samurai and Alpine mountain climbers. 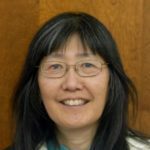 Carolyn’s note: Padre Eusebio Kino was the first Jesuit missionary who came to Sonora, Mexico (and later Arizona), from Tyrol (southern German province) to missionize amongst the indigenous population, establishing a network of missions across Southern Arizona. Hundreds of fellow Jesuit missionaries followed him. He died in 1711 and is buried Magdalena, Mexico. Statues of Padre Kino exist here in Tucson, in Washington D.C., and in Segno, Italy (his birthplace). Previous articleNational School Walkout today at 10:00 a.m.
Next articleTeachers, Taxes and Tea-Publicans, Oh My! About 80 people at this film premier about Padre Kino’s message of “hope and peace” through Aurora Vision production company, showing Kino in today’s eyes . The history of his arrival from Italy and work in Sonora, Mexico and his travels on horseback to California are documented through Mexicans who today trace his trail on horseback, as well as to his burial place in Magdalena for a yearly fiesta. AZ rancher Richard Collins is interviewed who has ridden part of this trail and who discusses the Border Wall, separating Mexico and the U.S. in the film. The current day Kino Border Initiative in Nogales is shown, which helps border crossers deported back to Mexcio from the U.S. Padre Kino is characterized as one with the native peoples in his missionizing of the Catholic faith, over 300 years ago. Former JP Carmen Dolny is interviewed in the film, was present at tonight’s premier, as was rancher Collins. Atty. Mark O’Hare of the Kino Heritage Society introduced the film, was also interviewed in the film. It is available on amazon.com, with a Nogales film showing tomorrow night.